Like you, I have watched in horror in over recent months at the extremely concerning rise in gang and knife crime across our capital. This violent crime has shocked us all and a number of parents in Mitcham and Morden have raised their concerns with me about the dangers facing children and young people. 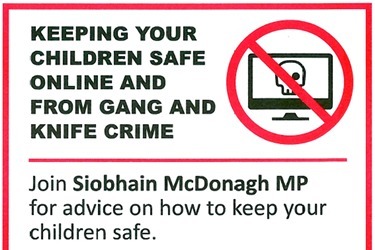 That’s why I organised a public event to provide advice and information to parents on keeping children safe online and from gang and knife crime. We had experts from Google and Facebook speaking about the dangers that young people face online and advising parents on the steps they can take to protect their children. Also in attendance was Chris Everett, Executive Principal of Harris Academy East Dulwich, and PC Kudliskis to talk about their experience keeping young people away from gang and knife crime. The presentations were incredibly informative, with a packed room in attendance. These talks were followed by an advice fair from 8pm, where parents had the opportunity to sit and speak one-to-one with representatives from organisations working with young people locally. Members of the local police teams, Merton Council’s youth service, and the AFC Wimbledon Foundation were present, including a number of other youth groups. Thank you to all who attended and all of the fantastic local organisations who volunteered their time so generously.